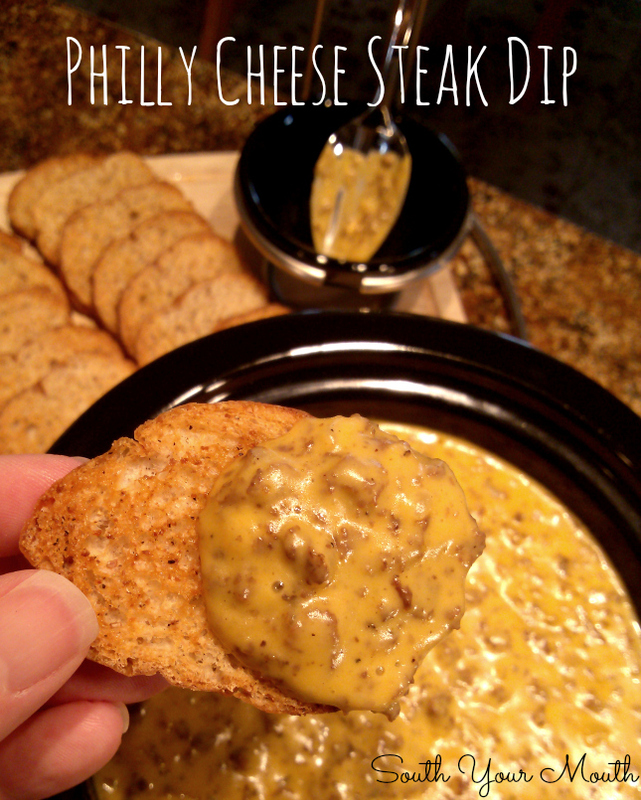 Easy crock pot recipe for Philly Cheese Steak Dip make with Steak-umms and Cheez Whiz. Nobody believes me when I tell them this but authentic Philly cheesesteaks are made with Cheez Whiz. It’s true! Folks may prefer them with other (real) cheeses such as provolone, but ask any Philly resident what goes on a real cheesesteak and they’ll tell you Cheez Whiz. What I don’t know is if it’s “cheesesteak” or “cheese steak” as I've seen it both ways and my spellcheck is telling me "cheesesteak" isn't a real word, I’m going to split it up and use one in the photo and one in the recipe. Also? I’d already added “cheese steak” to the photo when it occurred to me that “cheesesteak” might be the preferred spelling. Also? I don’t care which way it’s spelled because someone is going to tell me I’m wrong no matter how I spell it. And I’m already expecting an avalanche of comments about the Cheez Whiz thing. So anyway, I got to thinking about Cheez Whiz and how it would make a perfect dip since it’s so creamy and I decided to try to make a cheesesteak dip! My first inclination was to thinly slice a steak but that seemed kind of sacrilegious to obliterate a perfectly good steak just to throw it in a crock pot with processed cheese spread. I mean, that’s kinda like putting an elevator in an outhouse. So I thought, well, if we’re going to use Cheez Whiz, why stop there? Let’s really get the purists riled up and use something amazeballs like Steak-Umms. Ha! As a riff on the cheese steak rolls, I decided to make crostini* from whole wheat hoagie rolls but you can totally serve this with crackers or chips. Separate steaks from wax paper dividers and place on a cutting board. Cut steaks into 1-inch strips lengthwise. You’ll probably have to do this 4-5 steaks at a time unless you’re Paul Bunyan. You have to keep these frozen – they’re too delicate to work with when they’re thawed. Heat a large skillet over high heat. Add steak strips, onion, black pepper and garlic then cook until steak is cooked through, breaking the steak up as it cooks. Drain fat halfway through cooking so that the meat sears instead of boiling in the pan juices. Once steak is cooked through, drain again if necessary. Remove from heat then add worcestershire and Cheez Whiz. Stir until combined then add to a small crock pot. Heat on low until cheese is bubbly then reduce heat to “warm” until ready to serve. You can also heat this and keep warm in a small saucepan on the stove. Serve with crostini, crackers or chips. *to make crostini, slice hoagie rolls (or baguettes or French bread) into thin slices with a serrated knife. Brush with olive oil then sprinkle with salt and pepper. Arrange in a single layer on a baking sheet and bake at 400 degrees until lightly browned and crisp (about 5 minutes). Who cares what it's called, it's cheesy meaty goodness in a crockpot (or crock pot lol) It's just plain yummy looking...I'm getting some whiz tomorrow at the grocery!! What are Steak-Umms and where can I find them?? Click the link in the ingredients list. Who cares about the ingredients, they are good for occasional quick sandwiches & way cheaper than the real thing. Of course we prefer ribeye but who wouldn't. Sounds like a cool appetizer dip. Sizzle steaks instead of steak ums? Has anyone tried? There's also a brand called Landis sandwich steaks that are better than Steak Um's if you can find them in the frozen secton of the grocery store. You could also use fresh chip steak or bracciola. Philly Cheesesteaks are definitely made with Cheez-Whiz so you are totally correct on that one. I used to make this with Steak-Umms for my kids on bread when they were growing up, and I checked with reliable Philly sources to find out what cheese to use. Thanks for this recipe. All my kids will love it! Instead of using processed, frozen steak-ums, you can go to your butcher and have them shave rib-eye. It would make this recipe so much better. Any original Philly cheesesteaks use rib-eye; not frozen, processed stuff. OMG did you guys even bother to read the article? I recently took the kids to visit Philly and was excited to have an "authentic" cheesesteak until my aunt said your father is from Philly, you've been eating them all your life even if he has always used American. I didn't feel the need to order "one w/ whiz" after that but I do want to try this dip! Wonder if Velvetta would work same as CheezWhz? I live in Philly born and raised, you are on point with this, the secret to a Philly Cheesesteak is Amoroso rolls, and they are made in Philly, also we don't use "Steak Ums" never heard of them, we use real steak and cut it into strips, Geno's, Pats, Joes, Jims, and Princes all down in South Philly, make them that way, if I were you maybe I would add some wit onions and hot peppers, now that's a real Philly Cheesesteak, well a South Philly Cheesesteak. What other cheese can be used instead of cheese whiz and how much? What a great recipe! My kids are hosting game night Saturday. I'm printing this for them (and me) -- we all love Philly cheesesteak here. Looks so easy. Thanks for sharing. The best cheesesteak known to man (Joe's on Torresdale, formerly Chink's) uses thin-sliced ribeye, grilled onions and Whiz on a Liscio's roll. Amoroso's is good, don't get me wrong, but Liscio's is a world beyond that, and absolutely perfect for a cheesesteak. Pat's & Gino's are OK at best, Jim's on South Street is horrible (by far the most overrated place in the entire city), Campo's is small and overpriced and loaded with attitude, and Tony Luke's is good but overrated. And for folks not from Philly: I don't know where the whole peppers on a cheesesteak thing got started, but they are not part of a typical Philly cheesesteak. Steak, cheese (Whiz, American, provolone in that order of preference) and optional onions. That's it.